An upright, columnar shrub with twiggy, spiny branches. 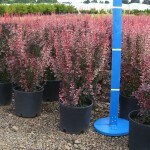 The new, deep red leaves are mottled with creamy white variegation. The foliage matures to burgundy purple, and contrasts with the new growth for a two-toned effect. It prefers full sun and adapts to most soils, as long as they are well-drained. It can be used as an accent plant, in a container, or for a thorny hedge. PP 18,413.